Open Farm Days visitors learn about, and see, the grains grown on the Banack farm. Consumers continue to be tremendously interested in how their food is grown. Getting farm producers and consumers together is one of the goals of Alberta’s Open Farm Days. This annual event provides an important connection for rural producers and their urban neighbours. Open Farm Days also continues to be a popular event for farm producers, with a 28% increase in host farm participation when compared to last year. For 2016, a total of 90 host farms will provide real-world farm experiences for visitors on Sunday, August 21. Once again, our Alberta Federation of Agriculture (AFA) Vice President, Humphrey Banack and his family will be participating as a host farm. Humphrey and wife Terry Banack will welcome visitors to their Camrose-area homestead and will provide information and demonstrations for those who attend. Humphrey and Terry say that Open Farm Days lets them provide visitors with a ‘mini-adventure’ with a hands-on look at how food is produced nearby in Alberta communities. This year, the Banacks hope to take visitors out harvesting and send them home with a bag of peas straight from the field that they can use in recipes at home. Check out this video for more information. Host farms that offer Open Farm Days “Farm Experiences” showcase a wide range of farm businesses including honey and berry farms, petting zoos, flower farms, plus more traditional agricultural enterprises like livestock, crop and vegetable farms. Open Farm Days also includes farm-to-table “Culinary Experiences” taking place on August 20 and 21. These events feature local chefs and producers that team up to provide unique field dinners, brewery tasting tours, cowboy gatherings and barbecues. Most of these events require ticket purchases in advance. Information can be found at http://www.albertafarmdays.com/. This AFA video taken during Alberta’s 2015 Open Farm Days event on the Banack Homestead shows what visitors can expect from a farm visit. We encourage you to make this fun event part of your summer plans! Liability insurance is, of course, important for every day situations that can occur on the farm—things like accidental property damage, unintended crop chemical drift and situations that arise from normal farming operations. If an accident of this type occurs, much of the hard work of the farm business could be lost if you are not adequately insured. And it’s equally important that you are covered for risks that may occur when you are conducting business off the farm. For example, if you transport your animals to 4-H shows or agricultural fairs, liability insurance can protect against injury to your animals. Do you plan to sell your product at a local farmers’ market? Many farmers’ markets may not cover individual vendors under the market’s group policy, and will require vendors to provide proof of liability insurance in order to participate in the market. In addition to being connected to The Co-operators through our corporate partnership, AFA is proud of our long history as a member-owner of the company. Founded by a small group of prairie farmers in 1945, The Co-operators today continues to sponsor rural youth through 4-H and provide specialized farm insurance to producers across Canada. For more information on the liability insurance options offered by The Co-operators to farm producers in Alberta, contact your local Co-operators agent, or visit The Co-operators website. To find out more about how you can become an AFA member today and save money through the special member benefits we have developed with The Co-operators, Mark’s Work Wearhouse and Fiat Chrysler Automobiles (FCA Canada), visit our website. The Alberta Federation of Agriculture (AFA) Board met in mid-June for their annual Summer Meeting, and were pleased to host a number of guests from key industries that are connected to agriculture. Three groups presented on a wide range of issues that have the potential to significantly impact Alberta’s agriculture industry. AFA provided input and ideas. Established in October 2003, the Office of the Utilities Consumer Advocate (UCA) has a mandate to educate, advocate, and mediate for Alberta’s residential, farm, and small business electricity and natural gas consumers. Since agriculture businesses can be greatly impacted by utility rates – especially large users like producers with hog barns, food processors or greenhouses – a UCA representative shared an overview and answered questions about Alberta’s Electricity Regulatory System. Alberta producers may be familiar with the Growing Forward 2 (GF2) programs that are part of a federal-provincial-territorial (FPT) partnership. These programs seek to help the agriculture and food industry reach its full potential by focusing on productivity, profitability and competitiveness in a global market. The current program expires March 31, 2018, and federal and provincial policymakers are now gathering producer input on the future of the next agricultural policy framework (APF). Read more about this on our recent blog (link May AFA blog). Representatives from Alberta Agriculture and Forestry met with the AFA Board at our Summer Meeting to discuss the impacts of potential refinements and opportunities for Alberta farmers in the new policy. As changes and updates to crop insurance programs occur in Alberta, AFA is involved in consultations with Agriculture Financial Services Corporation (AFSC) to provide the perspective of Alberta’s crop and pasture producers. During this session, AFA provided feedback on crop damage compensation for wildlife and vandalism, on-farm best management practices, refinements to coverage and premium assessment, advancing electronic interaction between AFSC and their clients as well as the potential to expand use of weather-based products. AFA’s Board and Directors will continue to be proactive with these types of discussions and ensure that agriculture’s voice is heard loud and clear. We love to give a shout out to our AFA members! Here’s a great story on what can happen when you are willing to look at things in a different light. Congratulations to the Morris family on the new addition to their business! Arnie and Shirley Morris have been successful quail egg producers for the last three decades. From their Ardrossan, Alberta farm, they supply western Canadian retailers with about 10,000 of these delicate eggs each day. 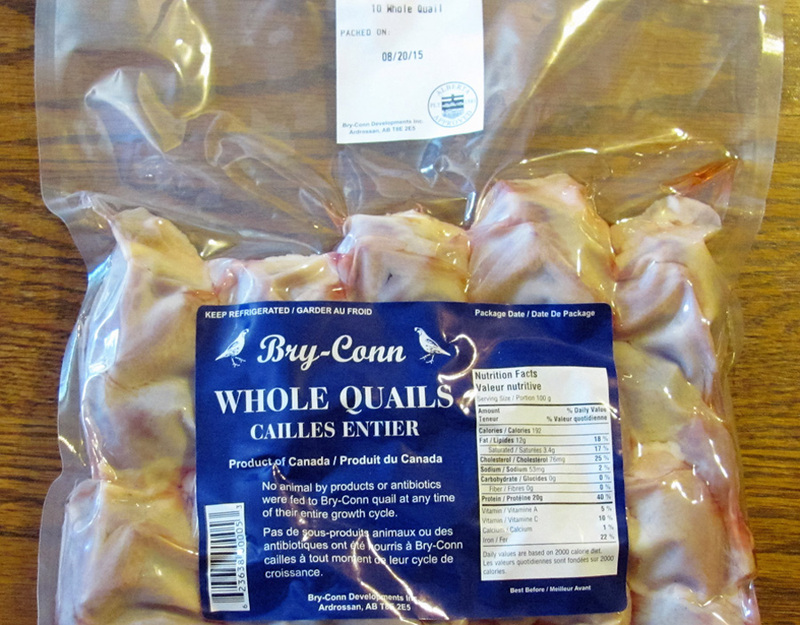 When the opportunity to sell quail meat arose, they knew ramping up their production would be no problem. Finding a processing facility for the tiny birds was another matter. Where others saw closed doors, the Morris family saw potential. 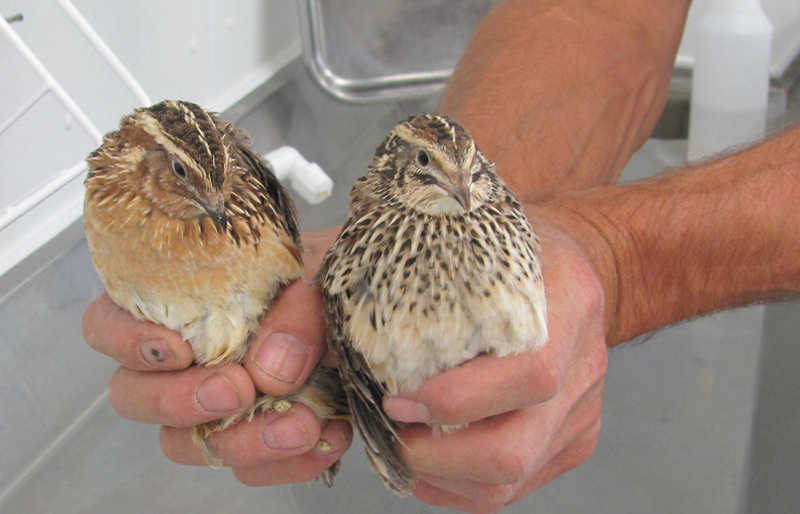 They decided to buy a custom mobile processing plant and became quail processors themselves. 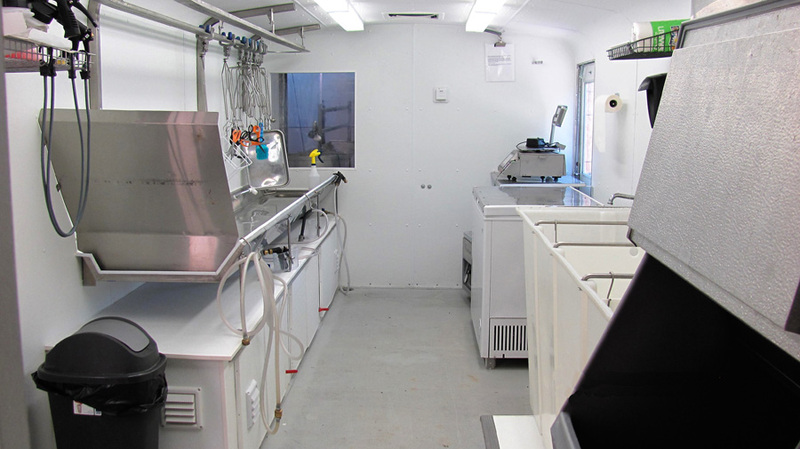 Inside the 28-ft. trailer, they can process quails, game birds and chickens plus create packaged meat for consumers. As Shirley explains, the mobile plant gives them a unique way to take advantage of new markets, like the farm-to-table movement. They can process up to 600 birds a day, plus vacuum-seal the meat and sell it either fresh or frozen. Growing this side of their farm business has not been all smooth sailing, but Shirley notes they have some terrific support both on and off the farm. Their children are now involved in the processing business. The Morris family also works closely with provincial meat inspectors to ensure the product meets the highest quality standards plus regulations for food safety, packaging and labelling. Shirley also credits Alberta Livestock and Meat Agency (ALMA) and Alberta Federation of Agriculture (AFA) staff as being instrumental in helping get this venture off the ground. The Morris family farm was also recently featured in The Western Producer. Click here to see the story and a video tour of the trailer! Today is Canadian Thanksgiving. We honor all who work to make this weekend an abundant one, filled with good food, family and friends. 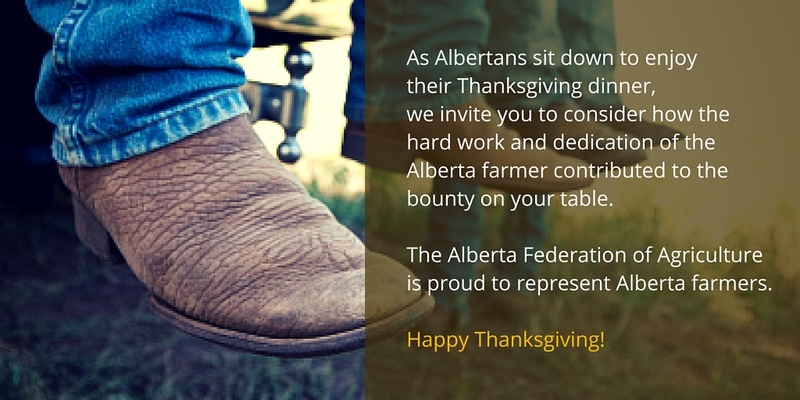 Thanks to all those in Alberta’s agriculture industry that make this weekend special!